All chameleons belong to a family of lizards called Chamaeleonidae, and have become quite popular as pets for reptile enthusiasts. Chameleons are well-known for the ability to change color and camouflage themselves into their surroundings. In their natural habitat, chameleons feed primarily on live, wild insects. In captivity, it is important that they are fed a balanced diet in order to get the proper nutrition. Certain types of fruits can be a good supplement to a chameleon's diet. Choose fruits that are high in nutrients and that possess a high calcium to low phosphorus ratio. Some fruits in this category are apples, peaches, blueberries, prickly pear cactus, mango, melons, bananas and cantaloupe. However, there are some precautions to take when feeding fruit to reptiles. While fruits are generally a good addition to a reptile diet, there are certain things you must be wary of. Many citrus fruits will be too acidic or bitter for lizards, and your pet will be likely to avoid citrus offerings because of this. The seeds and cores of many fruits can be toxic to reptiles, even though they are otherwise safe to feed. Apples, peaches, apricots and any other fruit with a pit can have dangerous elements. When feeding these fruits, always cut far away from the core. Because chameleons don't naturally eat chunks of fruit in the wild, they will not be able to eat a cut piece of apple or cantaloupe. Instead, grind the fruits you want to feed into a paste that will be easier for your pet to consume. Natural applesauce and commercial baby foods are suitable for feeding as well, but make sure that there are no extra spices, sugars or preservatives in them. Since chameleons derive most of their nutrition from their live food, it is important to nourish feeder insects well. This process is called gut-loading. 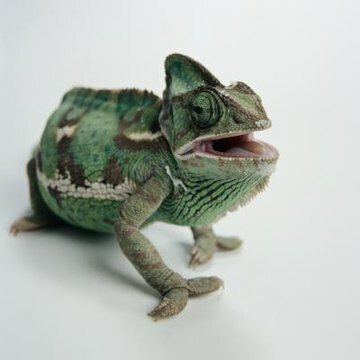 If you are keeping or raising live crickets for your pet, any fruit you feed those crickets will in turn be fed to your chameleon. Similarly, any nutrients missing from the feeder insects' diet will be missing from your chameleon's diet. If your chameleon doesn't respond to a direct addition of fruit in his diet, gut-loading is a way to make sure he's getting those extra vitamins.